The thing is, we were all gonna see the new “Captain Marvel” movie already. Female superhero badass empowerment and such. But then they put out the character posters and included one for a cat and, well, hello. 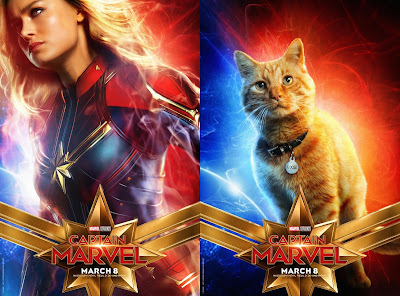 *full lesbian swoon* Yes, Goose the Cat gets his own poster. If, in fact, Goose is a he. Or a cat. 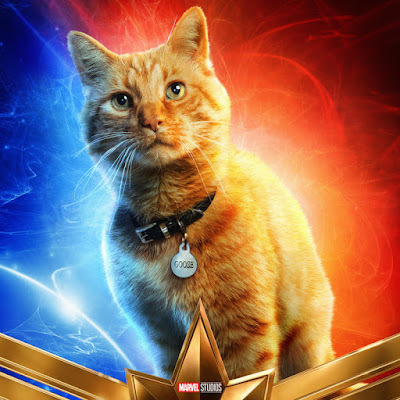 But, kittens, the more I see of this movie the more excited I get. And that’s a very, very good thing. Also good? All the female characters look great including stoic Annette Bening, Smurf Gemma Chan and Top Gun BFF Lashana Lynch. Though, to be honest, I would still be in if it was just a heartwarming story about a girl and her probably/hopefully/maybe cat. Girls, the name of the black woman is Maria R.
No, of course I had nothing to do with the movie. And I'm not black, either. Though I have black hair. And straight, like her. It's easier for me to have straight hair than for a black woman, that's true. But she's a techie, girls. A real techie. I can tell. Only a real techie thinks she looks best inside a mean big machine. As you said, gotta watch the movie. At long last they're starting to have superheroes like me.